About Good News Tree Service, Inc. | Good News Tree Service, Inc.
About Good News Tree Service, Inc. When you think of trees, think of Nathan Lawrence and Good News Tree Service, Inc.
From climbing trees on the family farm, to caring for trees in the family nursery, to pruning fruit trees in the family orchard when he was a kid growing up in Tigard, Nathan’s life has centered around trees. When he was 13, he built a two-story tree house 25 feet up in an eight-trunked maple tree, where he often enjoyed spending the night. Also at age 13, he started a business trimming the neighbor’s fruit and ornamental trees. He worked his way through college planting, removing and pruning trees and shrubs in the family landscaping business. 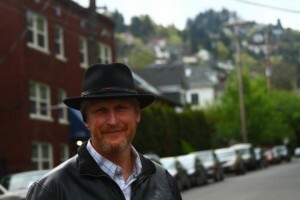 He wrote about plants in his weekly gardening column in the Portland area. As an OSU Master Gardener, he did a series of television shows on how to care for plants. In 1985, he started a business that evolved into a full-fledged tree care company. As an ISA Certified Arborist, ISA Tree Risk Assessment Qualified (TRAQ), OSU Master Gardener, and State Registered Commercial Pesticide Applicator, and plant health care specialist, put Nathan’s decades of experience in the care of plants in the Portland Metro region to work for you when you hire Good News Tree Service, Inc. to care for your trees and shrubs the next time. We provide old-fashioned service and business ethics while using modern, state-of-the-art technology and cutting-edge aboriculture techniques and information to care for your trees and shrubs.